U.S. SENATE — U.S. 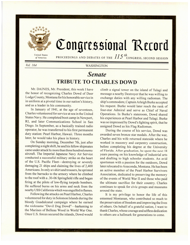 Senator Steve Daines today recognized Charles Dowd for his honorable service to the nation and his community. Mr. DAINES, Mr. President, this week I have the honor of recognizing Charles Dowd of Deer Lodge County, Montana for his honorable service in in uniform at a pivotal time in our nation’s history, and as a leader in his community. In January of 1941, at the age of seventeen, Charles volunteered for service at sea in the United States Navy. He completed boot camp in Newport, RI, and later Communications School in San Diego. In September, as a basically trained radio operator, he was transferred to his first permanent duty station: Pearl Harbor, Hawaii. Three months later, he would take his place in history. On Sunday morning, December 7th, just after completing a night shift, he and his fellow shipmates came under attack by more than three hundred enemy aircraft. The Imperial Japanese Navy Air Service conducted a successful military strike on the heart of the U.S. Pacific Fleet--destroying or severely damaging 21 ships and claiming the lives of 2,400 Americans. In only a t-shirt and trousers, he sprinted from the barracks to the armory where he climbed to the roof with a .30-06 Springfield rifle and began firing at the pilots of low-flying torpedo bombers. He suffered burns on his arms and neck from the nearby USS California which was engulfed in flames. Following the attacks on Pearl Harbor, Charles volunteered for duty in Solomon Islands during the bloody Guadalcanal campaign where he earned the nickname “Devil Dog Dowd”—harkening to the Marines of Belleau Wood in World War One. Once U.S. forces secured the islands, Dowd would climb a signal tower on the island of Tulagi and message a nearby Destroyer that he was willing to exchange duties with any willing radioman. The ship’s commodore, Captain Arleigh Burke accepted his request. Burke would later reach the rank of four-star Admiral and serve as Chief of Naval Operations. In Burke’s stateroom, Dowd shared his experiences at Pearl Harbor and Tulagi. Burke was so impressed by Dowd’s fighting spirit, that he assigned Dowd as his Flag Radioman. During the course of his service, Dowd was awarded seven bronze star medals. After the war, Charles and his wife returned stateside where he worked in masonry and carpentry construction, before completing his degree at the University of Florida. After graduation, he spent the next 18 years passing on his knowledge of industrial arts and drafting to high schooler students. An avid sportsman with a passion for the outdoors, Dowd later relocated to Anaconda, Montana. He has been an active member of the Pearl Harbor Survivors Association, dedicated to preserving the memory of the events of World War II and those who paid the ultimate sacrifice for their country. Charles continues to speak for civic groups and museums around the state. It is my privilege to honor the life of this esteemed Montanan, who contributed so much to the preservation of freedom and improving the lives of others. On behalf of a grateful nation, I want to thank Charles, whose courage and selfless dedication to others are a hallmark for generations to come.